DALLAS (AP) — American Airlines is promising to run a near-normal operation on Wednesday, and that would be just fine for the tens of thousands of passengers who were stranded by a mammoth technology meltdown at the nation's third-biggest airline. On Tuesday, American and sister airline American Eagle canceled about 1,000 flights and delayed at least 1,100 more, according to flight-tracking services. That means American and Eagle canceled or delayed nearly two-thirds of their scheduled flights after they lost access to a computer system that's used for everything from issuing boarding passes to determining how much fuel to pump into the plane. It was a public-relations nightmare for American, which is preparing to merge with US Airways and become the world's biggest carrier. Passengers took to social media sites to criticize the airline, which for hours could only apologize and say that it was trying to fix the problem. American posted a video apology from CEO Tom Horton that provided the airline's most detailed explanation of the outage. "As you'd imagine, we do have redundancies in our system," Horton said, standing in front of employees and banks of computer monitors in the airline's control center in Texas, "but unfortunately in this case we had a software issue that impacted both our primary and backup systems." The man who will lead American in a few months, US Airways CEO Doug Parker, has said he would prefer to convert his planes and employees to American's computer system rather than the other way around. US Airways declined to comment on whether Tuesday's breakdown would cause Parker to rethink his plans. The computer outage began snarling operations around midmorning. Eventually the Federal Aviation Administration issued a so-called ground stop for American Airlines jets around the country. Flights already in the air were allowed to continue to their destinations, but planes on the ground from coast to coast could not take off. And travelers could do little to get back in the air until the computer system was restored. By late afternoon, American resumed international flights and those from its major hub airports. It scrambled during the evening to put planes and crews in position to get off to a good start on Wednesday morning. "Despite the magnitude of today's disruption, we are pleased to report that we expect our operation to run normally with only a small number of flight cancellations" on Wednesday, said Andrea Huguely, a spokeswoman for American. She said American would add flights to accommodate stranded passengers. American blamed the outage on a loss of access to computer networks that are used for flight reservations and many other functions. Airlines commonly rely on such systems to track passengers and bags, monitor who boards planes, and update flight schedules and gate assignments. The computers are also used to file flight plans and tell employees which seats should be filled to ensure that the plane is properly balanced. American's system is hosted by Sabre Holdings, a one-time division of American that was spun off into a separate travel-reservations technology company. American said the outage wasn't Sabre's fault, and other airlines that use Sabre didn't experience problems. 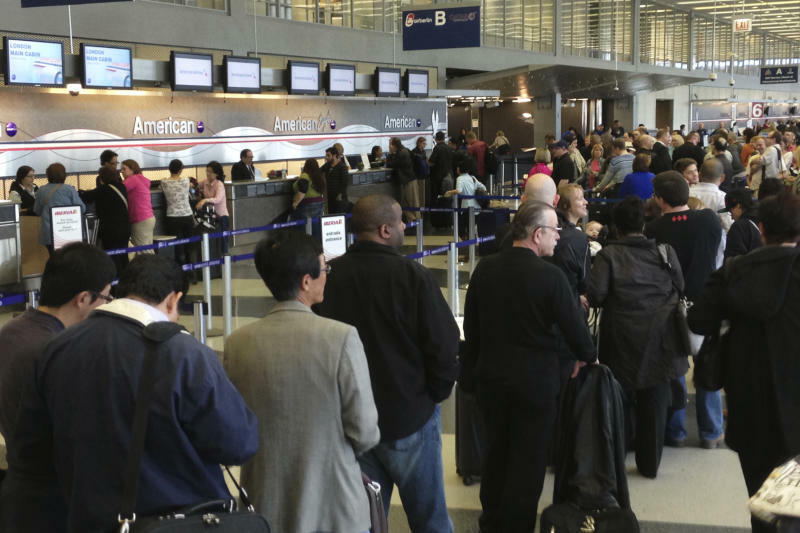 At airports, customers whose flights were canceled couldn't rebook on a later flight. 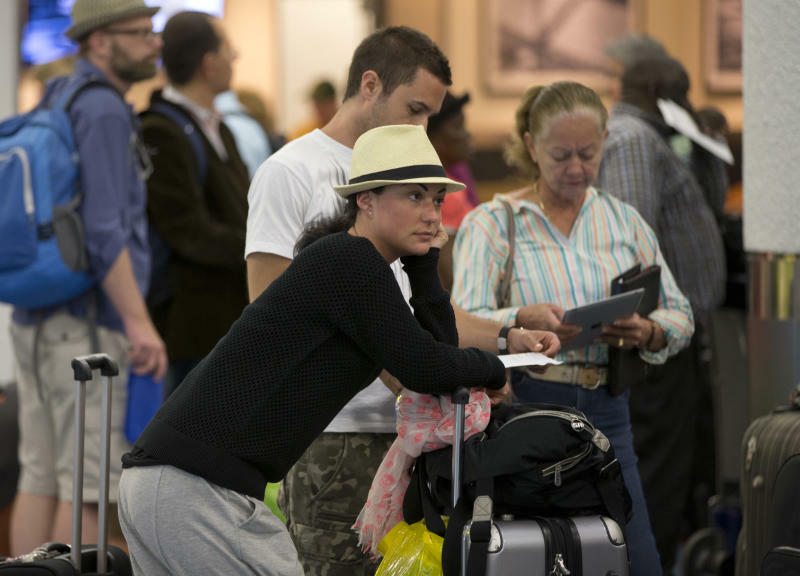 Passengers already at the airport were stuck in long lines or killed time in gate areas. "Tensions are high. A lot of people are getting mad. I've seen several yelling at the American agents," said Julie Burch, a business-meeting speaker who was stuck at Dallas-Fort Worth International Airport waiting for a flight to Denver. "Nobody can tell us anything." Terry Anzur, a TV news consultant from Los Angeles who was also stranded in Dallas, said American Airlines gate employees were doing everything the old-fashioned, manual way because their computers were useless. "No one at the counter can do anything. They can't check people in," Anzur said. "The airline is at a dead halt." Theoretically, an airline could do the same work as the reservation system manually for any one flight. But doing it for hundreds of flights isn't practical. American and Eagle operate about 3,300 flights a day. Now, if the reservations systems go down, "most airlines would be pretty much without the ability to fly more than a very limited number of flights," said Scott Nason, American's former technology chief and now a consultant. Nason said airlines find and fix the problem, but the next time something else causes an outage. One time, a possum chewed through a cable in Tulsa, Okla., bringing down the whole system. Another time, a worker in the airline's data center used a metal tool instead of an insulated, rubber-coated one — a short-circuit crashed much of the system, he said. Brent Bowen, a professor of aviation technology at Purdue University, said massive system failures are inevitable as airlines grow increasingly reliant on technology. "As those systems get bigger and more complex, at some point you're going to have a systemic failure," Bowen said. He added that financially strapped airlines may have underinvested in technology during the past decade, making the computer systems more vulnerable. AMR has lost more than $10 billion since 2001 and filed for bankruptcy protection in late 2011. American's problems on Tuesday were reminiscent of what United Airlines passengers endured for several days last year. After merging with Continental, United experienced computer glitches in the combined reservation system. On one day in August, 580 United flights were delayed, and its website was shut down for two hours. 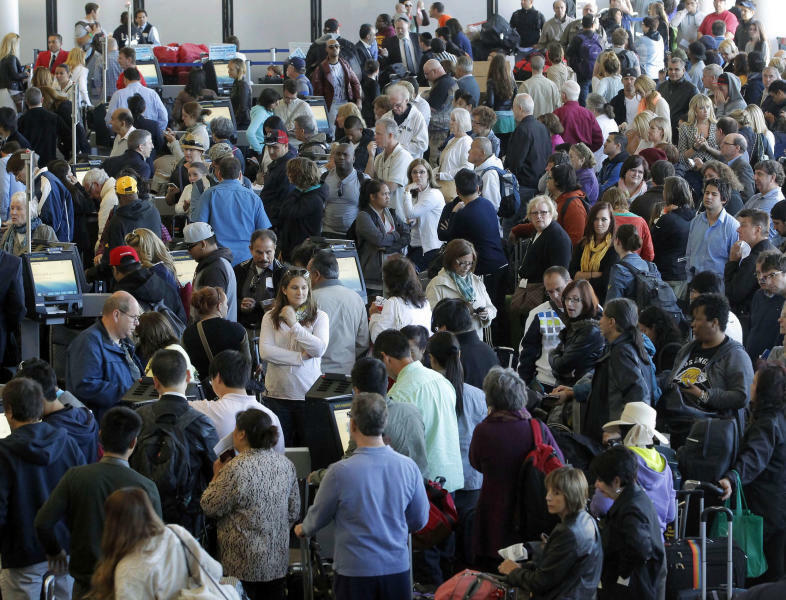 Another outage in November delayed 636 flights. The problems prompted an apology from United Continental Holdings Inc. CEO Jeff Smisek, who acknowledged that his airline had frustrated customers and would need to work to win them back. American began making amends by offering to book people who needed to travel Tuesday on other airlines and pay for the fare difference. For those who wanted to delay their trips, American offered refunds or waivers from the usual fee for changing a reservation. But for several hours, the airline wasn't able to process those changes and refunds — because the computers were down. Associated Press Airlines Writers Scott Mayerowitz in New York and Joshua Freed in Minneapolis contributed to this report.